It’s that time of year again when we go through cabinets, fridge and freezer searching for chametz and rack our brains on how to use them up before Passover. I love this challenge each year, especially because I usually have a few bags full of leftover challah just waiting to be used in a new recipe. Bread puddings are often sweet and served for dessert; while stuffing is usually savory and served as a side dish. 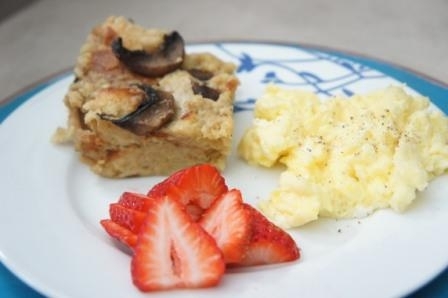 But I wanted to sort of combine both these concepts and do something a bit different – a savory, dairy bread pudding perfect to serve for breakfast or brunch! And thus, my Savory Breakfast Bread Pudding with Goat Cheese and Mushrooms was born! Don’t like mushrooms? Use spinach or peppers instead.Serve with scrambled eggs and some fruit for a perfect, rounded breakfast. Cut or break bread into chunks. Grease a 9×9 square pan and place bread into pan. Heat olive oil and butter in saute pan over medium heat. Add fresh thyme to pan. Saute mushrooms for 3-4 minutes. Season with salt and pepper. In a medium bowl, whisk together milk, heavy cream and eggs. Add goat cheese. It’s ok if the goat cheese remains in small chunks. Add mushrooms to milk mixture, but remove the fresh thyme. Pour milk mixture over leftover bread chunks and let sit for 1 hour. Meanwhile, preheat the oven to 350 degrees. Bake bread pudding for 35-45 minutes. Serve warm or room temperature. Can be served next day. A less traditional Rosh Hashanah dessert alternative.